The Subway Surfers Animated Series Has Finally Arrived | YAYOMG! SYBO Games has done quite a bit to tease their new Subway Surfers series. 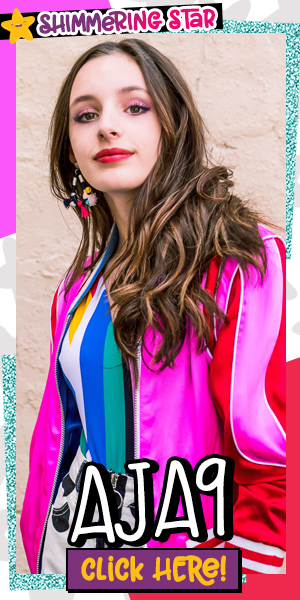 Fans were able to participate in an advent calendar style scavenger hunt around the holidays, and they’ve shared lots of teaser artwork and videos to get fans hyped. Today is finally the big day, the first episode of the Subway Surfers animated series premiered on their YouTube Channel and website earlier today. We checked out the first episode and can safely say that it’s a whole lot of fun to watch, gorgeously illustrated, and full of surprises! Transforming the world and characters of Subway City from a mobile game to a full-blown animated series means that fans will get to explore the city in a whole new way. You’ll see lots of familiar places, but the Subway Surfers animated series will take fans to places they’ve never been before! 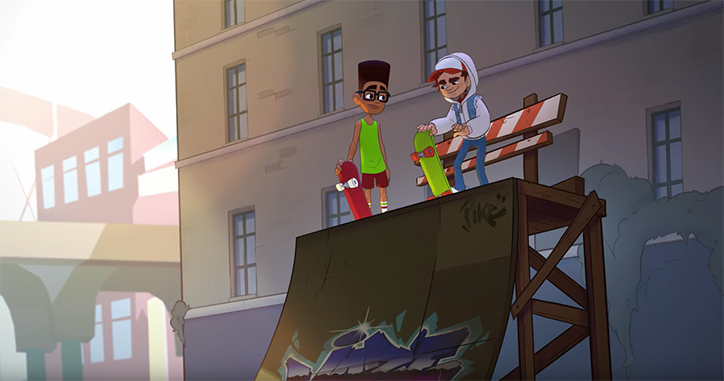 We’re looking forward to seeing every single inch of the city where our favorite characters love to skate, hang out, and have exciting adventures! Plus, there’s something super suspicious going on that’ll have you itching for new episodes. It’s kind of amazing to watch Tricky, Jake, Fresh, and Yutani come to life before your eyes. The first episode only takes place in their iconic hangout, but we learn so much about the characters we never knew before. In the first episode, the gang give Tricky advice on how to tell her mom she’s not interested in taking ballet lessons anymore. Jake and Fresh face off in a competitive game of SKATE while Yutani discovers something with her metal detector that could change their lives forever. All that and more in just a four-minute episode! We can’t wait to see what happens next! 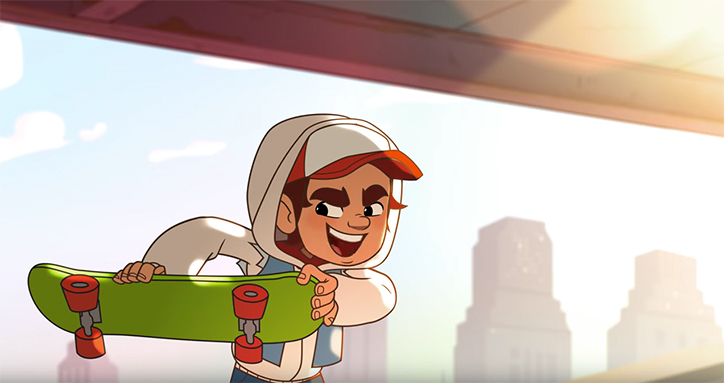 The first episode of the Subway Surfers animated series premiered today, and there’s lots more where that came from. 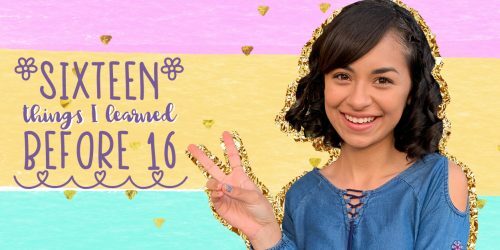 There will be a total of 10 of these short-form episodes premiering this year, with a long-form series in the works for 2019! The series has some big names behind it too. Brent Friedman of Star Wars Rebels and Star Wars: The Clone Wars as well as Francesca Marie Smith of Hey Arnold! are scripting the series. 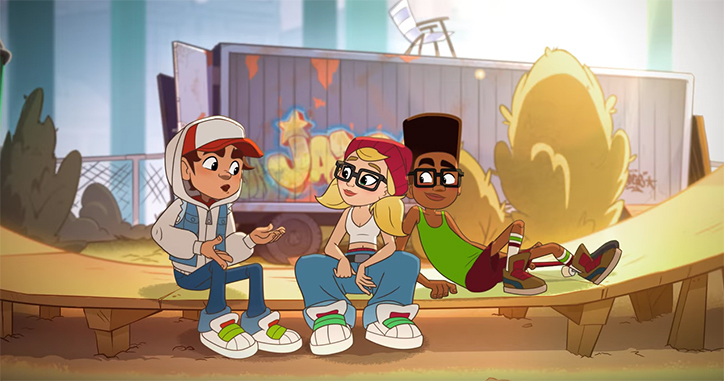 With Brent’s experience writing the thrills and excitement of Star Wars paired with Francesca’s experience writing the heartfelt, authentic characters of Hey Arnold!, we think the Subway Surfers animated series could quickly become a hit with both fans and newcomers alike! 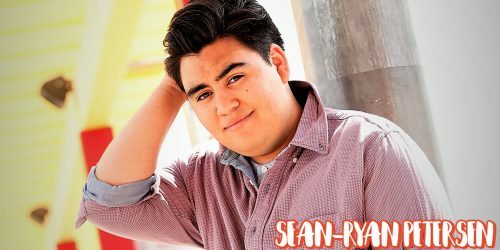 The series is produced by Sander Schwartz, who is a Daytime Emmy-award winning producer and has worked on shows like The Batman, Justice League, What’s New, Scooby Doo, and Teen Titans. Ready to watch? Hit up the Subway Surfers website to see Episode 1, “Buried” and check back each week as the new episodes unlock! If you’re mobile game obsessed like us, we think you’ll love KleptoCats 2!